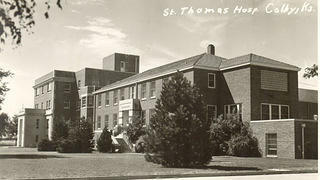 St. Thomas was constructed in 1941, with a four-story addition built seven years later. That’s the nickname that some locals have lovingly bestowed on their town of Colby, Kansas. As one of the closest major towns to the Kansas-Colorado border, Colby serves as something of a gatekeeper, sending off travelers departing from the Midwest proper and welcoming new arrivals. But for the tenants of the St. Thomas Historic Residences, the nickname applies just as well to the building they call home. Once a dilapidated former Catholic hospital, St. Thomas reopened in August of 2014 as a building for affordable apartment living—a boon for low-income seniors and families in the area. “St. Thomas has truly made a difference in [Colby],” says Angela Morehead, executive director of Preserving US. The nonprofit works with developers to find historic buildings that can be rehabilitated into affordable housing. An undated historic photo of St. Thomas Hospital. 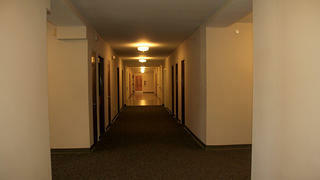 One of St. Thomas' hallways prior to renovation. 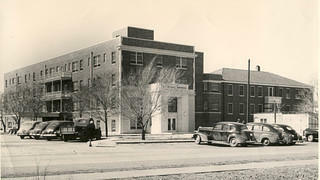 Constructed in 1941, the four-story, Georgian Revival-style St. Thomas Hospital served as Colby’s sole hospital for nearly three decades. Its founders envisioned the hospital as a “shelter from the ills of the world,” tucked away in rural Kansas. But when Colby built a new hospital in 1971, St. Thomas’ services were relocated. The town attempted to find a new use for the building, turning it into everything from classrooms to administrative space for the state health department, but nothing stuck. 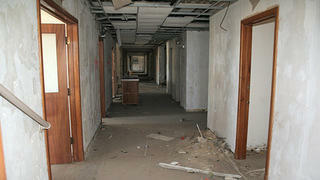 It eventually fell vacant in 2006 and quickly began to deteriorate. That’s when Tim Quigley of the development group Cohen-Esrey came across the property. 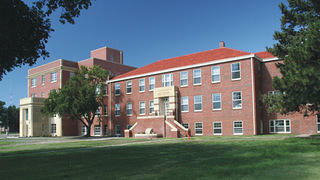 Quigley saw its potential for use as affordable housing, and approached the Kansas Housing Resource Corporation and Preserving US to determine the feasibility of the project. Together, they developed the rehabilitation plan, and Cohen-Esrey purchased the property in 2011. As with many projects of this nature, much of their plan depended on Historic Tax Credits (HTC) as an invaluable financial resource. The development team secured some funding via Low Income Housing Tax Credits, but far less than was needed to make the rehabilitation achievable. St. Thomas had deteriorated significantly in its five years of vacancy. Many of its single-pane glass windows had broken, and flooding issues resulted in water seeping down the brick and limestone exterior of the building and into the parking lot. However, many features of the old hospital were successfully preserved. The building retained its original marble floors and stained glass windows, and its chapel was converted into community space. 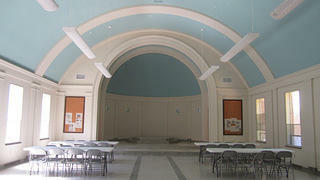 The hospital's former chapel now serves as an event space for residents. 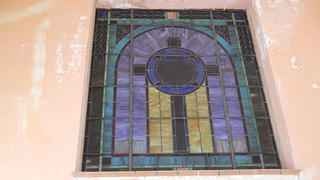 St. Thomas' stained glass windows were boarded up during its time as a school building. One of St. Thomas' hallways after renovation. Over three years and $7 million later, the St. Thomas Historic Residences were born. With 30 spacious apartments in all—seven one-bedroom and the rest two-bedroom—the residences have been fully occupied since the day they opened. Preservation US has not only continued to monitor St. Thomas, but has also initiated many programs that benefit its residents. The nonprofit provides health care information for inquiring tenants, and plans to host performances by local music and drama students in St. Thomas' chapel. At other locations, Preservation US offers after-school care and classes on responsible budgeting.